Rice is a healthy food and it has lots of benefits. Rice vinegar, derived from rice, also has lots of health benefits. This is a flavouring agent and is used as a condiment in Asia and other continents. It is added in salads and meat based dishes. However, it has low acidity quotient than other types of vinegar. So, it is not suitable for preserving foods and pickles. adding rice vinegar to a dish adds a subtle flavour to it. You get rice vinegar in different varieties. Broadly there are two types of rice vinegar, which are unseasoned and seasoned. Using the unseasoned variety gives you the maximum benefits. There is a rice wine that is sweet and contains alcohol. But this is not rice vinegar. 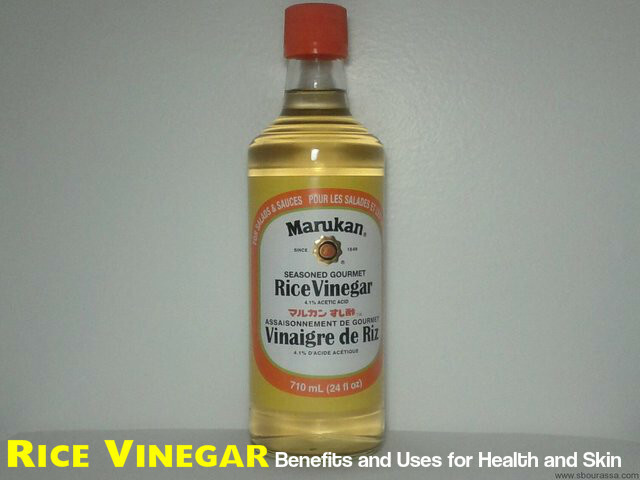 Brown rice vinegar is an important ingredient in many of the antiseptic medicines. This is because it has the ability to destroy the harmful bacteria when it comes in contact with them. So, it is used in many of the native medications for the treatment of a number of health issues. Phenolic compounds in rice vinegar help in protecting your body from various diseases like cancer, osteoporosis, heart diseases and diabetes. They also give protection to your body from the harmful actions of the UV rays. Rice vinegar contains acetic acid in high amounts. This is good for improving your digestive health. It also allows your body to absorb more nutrients from the food you consume. This means that your body will be able to absorb more potassium, calcium and vitamins from the food. This helps in improving your health. White rice vinegar is good for controlling the levels of blood sugar and liver functions in diabetic patients. A variant of Japanese rice vinegar, called kurozu, is made by fermenting brown rice. This is said to have the ability to protect your liver. This was mentioned in the coveted ‘journal of clinical biochemistry and nutrition’, based on a study made in 2011. The researchers are of the opinion that this vinegar can prevent the onset of liver tumours. Rice vinegar contains amino acids in moderate amounts. These help in fighting against the development of lactic acid in the blood. Development of lactic acid in the blood can cause stiffness, fatigue and irritability. So, including rice vinegar in your diet can help you remain fresh and energetic throughout the day. Japanese rice vinegar called kurozu has antioxidant properties which help in protecting you from colitis. According to studies made, when diets including kurozu were taken, it helped in promoting weight retention and lowered the levels of nitrate compounds. Nitrate compounds are toxic to the colon. Rice vinegar is known to contain essential amino acids. These amino acids are needed for keeping you healthy. They have the ability to fight against the free radicals formed in the body. They are also good for increasing your immunity power. Including rice vinegar in your regular diet is an excellent way to prevent the formation of fatty peroxide in your body. This way it helps in slowing down the build up of cholesterol on the walls of the blood vessels. In the long run, it helps in keeping your heart healthy. Remember to add a few teaspoons of rice vinegar in your meals every day. If you are planning to lose weight, then rice vinegar is a good option for you. Consume rice vinegar with your food. According to studies made, rice vinegar is very beneficial for helping you lose the extra flab on your body. In Japan, people have been using it for ages to control their weight. The best variety for this purpose is the vinegar made from brown rice. You can use rice vinegar as a facial toner instead of using toners that are available in the market. It is chemical free and natural. Many women use OTC facial toners to prepare their facial skin for applying creams and moisturizers. Instead of these toners, using rice vinegar is more effective as it may not cause any side effects as the chemical laden toners do. Mix distilled water, rice vinegar and tea tree oil and use this mixture to tone your face. You can make it and keep in a bottle for using whenever needed. Apply it with a cotton ball or spray it on your facial skin. Rice vinegar is also good for your skin. But many people are unaware of this fact. All you have to do is to mix rice vinegar with purified water and tea tree oil. Keep the mixture in a bottle. Shake the bottle well before you use it. Just dip a cotton ball in this mixture and apply on areas that are affected with acne. Wait till it gets dry and then you can wash it off with water. Take a clean bottle and fill about one-third of the bottle with rice vinegar. Now you have to fill the rest of the bottle with distilled water. Next, add a few drops of tea tree oil into the bottle. You can add 3 to 4 drops of tea tree oil per 100 ml of the solution.